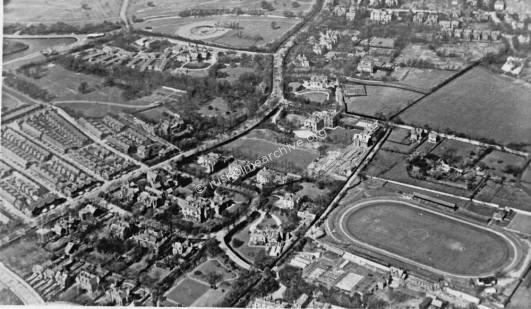 The aerial view below showing the stadium foreground was taken in the 1930’s looking in a northerly direction, you can see Platt Fields Park in the top left of the frame. The Fallowfield stadium was originally opened in May 1892 as the home of the Manchester Athletics Club after the club had been forced to move from its original home at the Old Trafford cricket ground. It remained primarily as an athletics stadium for most of its lifetime but also featured a number of other sports. Perhaps most prominently it was host to the Football Association cup final between Wolverhampton Wanderers and Everton. The game was played on Saturday 25th March 1893 in brilliant spring sunshine. 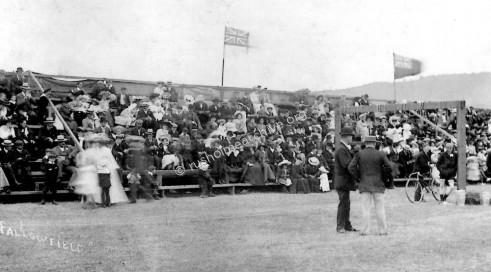 It was the first time the final had been played outside of London, save for a replayed match at Derby in 1886. "Never, it may fairly be said, has a football match created so much public interest as that which was played at the ground of the Manchester Athletic Club, Fallowfield on Saturday. The “gate” was certainly the largest ever seen at such a gathering in Manchester. The “oldest inhabitant” does not remember a day when Oxford-street and Wilmslow Road presented a scene so animated. The footpaths of the principal streets of the city for two or three hours about mid-day were thronged with “country cousins” who had come in by excursion trains from places near and far. Even as early as eleven o’clock the more enthusiastic devotees of the game begun to make their way to the ground where the great encounter was to take place. Large numbers walked leisurely to Fallowfield, but by far the greater number availed themselves of the tramcars, the omnibuses, and the brakes, of which there was an abundant supply". The kick-off had been scheduled for 3.30pm but by 11.30am the queues were already forming with trainloads of fans pouring in from Merseyside and the Midlands and leading to chaotic scenes not only at the stadium but in and around Fallowfield and Rusholme. By 12.30pm more than 5,000 had already made their way into the ground. A schoolboy game entertained the crowd before kick-off but by the time that ended the stadium was filled to capacity with the spectators spilling onto the touchlines while thousands more were unable to get into the ground. In all it was reckoned at least 45,000 had turned up although some estimates put it at nearer 60,000 and there were record gate receipts of £2,500. The 192 Manchester policemen on duty struggled to cope with the crowd, especially when fighting broke out among the fans, and there was serious danger of an accident or the game having to be abandoned. "Prior to either entry a mendicant cornet player had excited the mutual admiration of rival spectators along the south side of the field by his solo of “The Conquering Hero.” and this led up to the stentorian shouting from thousands of throats of the chorus of the inevitable “Man that broke the bank at Monte Carlo.” Owing to the breaking of bounds already noticed there was much indignation in the rear ranks among those whose view had been spoiled, and some nasty missiles were thrown at those in front with the object of inducing them to sit down or disappear. There was at least one incident of a stone so flung striking a journalist on the forehead, and causing him serious toss of blood from the wound inflicted. The police strove hard to preserve the edge of the turf from the invading mob, but it was vain, and during the match the ball was frequently among the more forward of the onlookers". Everyone agreed that it was the largest crowd to have been at a football match to that date. 'The sight,’ reported the Sporting Chronicle, ‘was such as had never been previously seen at a football match in any part of the world.’ As kick off approached there was a surge forward and the two teams had to battle their way through the crowd to get onto the pitch. In the end the game took place with Wolverhampton winning by the only goal of the game. Everton however were not happy and demanded a replay, complaining unsuccessfully to the FA that the large crowd standing and sitting on the touchline had impeded their game and that the ground was not fit for a competitive match. Although the stadium would never host another FA Cup final it did host the following year’s semi-final when Bolton beat The Wednesday 2-1. 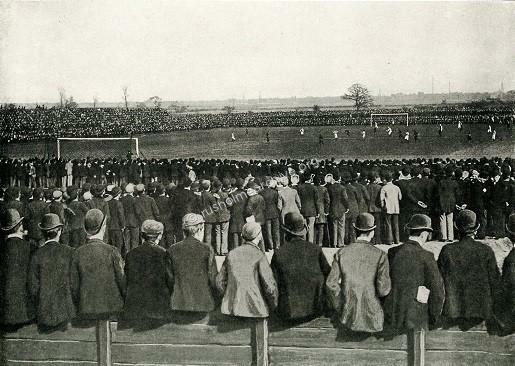 In 1899 another FA Cup semi-final was staged at the ground, or rather was supposed to have been staged. This time it was the second replay between Sheffield United and Liverpool, the first two games having been drawn. The game was scheduled for a Monday afternoon and more than 30,000 turned up but with the crowd continually spilling onto the pitch, the referee had to abandon the game at half-time with Liverpool leading 1-0. 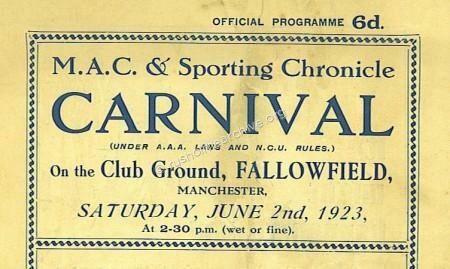 That game marked the end of Fallowfield as a ground for major football matches. But a link with football did continue when in 1907 Manchester United players, including the great Billy Meredith who were in dispute with the club and the footballing authorities over the maximum wage, trained at Fallowfield. They were known as the Outcasts although they would soon resume normal relations back with United. But if football proved to be too popular for comfort, it was less so with rugby league. And in 1899 and 1900 both Challenge Cup finals were held there. In the 1899 final Oldham beat Hunslet 19-9 in front of 15,763 spectators and the following year another local team, Swinton, beat Salford 16-8 in front of 17,864 spectators. That game was scheduled to have been played in Broughton but with a large crowd anticipated it was moved to Fallowfield just three days before. A number of RL Challenge cup semi-finals were also played there. And for a time Fallowfield was also the home ground of Broughton Rangers, at the time a leading rugby league side. Rugby union was also played at the stadium with the last ever England home international outside London played there when England beat Scotland by 12 points to three in March 1897. 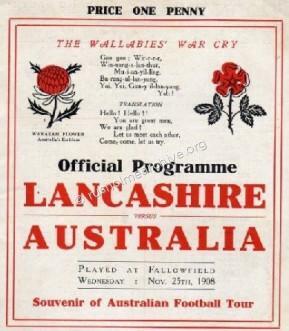 Some years later in November 1908 Lancashire played host to Australia but lost 12-6. 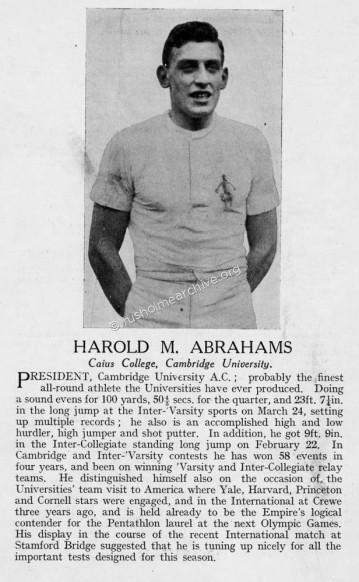 One of Abraham’s friends was Aubrey Montague, another Olympian athlete from Cambridge University, whose home was nearby in Oak Drive, Fallowfield. Aubrey Montagues mother was the daughter of C P Scott, Editor of the Manchester Guardian. 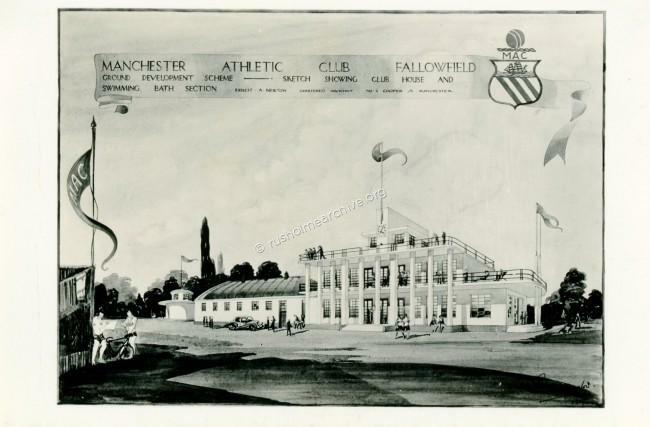 In 1937 the committee of the Manchester Athletics Club announced ambitious plans for new facilities including a swimming pool. The Lord Mayor of Manchester offered to support the club by leading an appeal for at least £6000.00, the entire cost of the new stand, clubhouse and relaying the cycle track was estimated to be £16,000.00. The photograph below is presumably the architects image of how the new clubhouse would eventually look. The venture did not succeed, there was no explanation but perhaps the onset of the war within a couple of years was the principal cause. 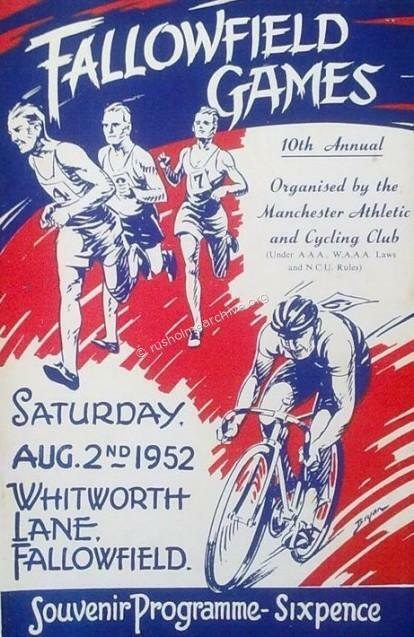 Throughout the period the stadium was also being used for cycling and was the home track of the Manchester Wheelers. The photograph below is dated 1904. The 1901 meet was recorded on film; some 15 minutes in total can be viewed on the British Film Institute website. This film was shown at the St James Hall Oxford Street, Manchester twice daily according to an advertisement in the Manchester Courier. ‘The Thomas Edison animated pictures have been seen by 892,925 people in the last 12 weeks, includes scenes from the Fallowfield Stadium’. 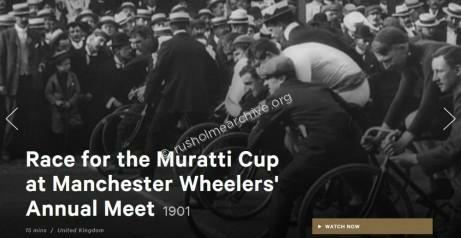 The first 2-3 minutes is of a motorised tricycle race, then cycle racing together with a riding and firing competition in which teams from each of the cyclists’ companies of the six Volunteer Battalions of the Manchester Regiments will participate. In 1919 the stadium hosted the national championships and in 1934 the British Empire Games. 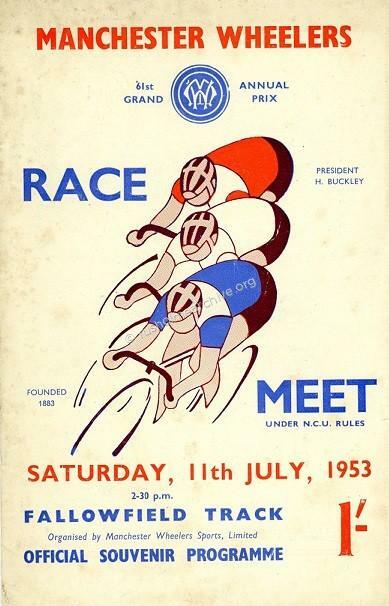 Perhaps the most famous cyclist to use the track was Reg Harris who set a number of world records there. But with the venue falling into disrepair in 1955 Bury born Harris, bought the stadium himself and it was for a period renamed the Reg Harris Stadium. The cycle track was originally made of shale but was later resurfaced with concrete. It was 509 yards in circumference with two 30-degree bankings at either end. Even in the mid 1980s you could still see the old banking with the Bovril advert at the top. 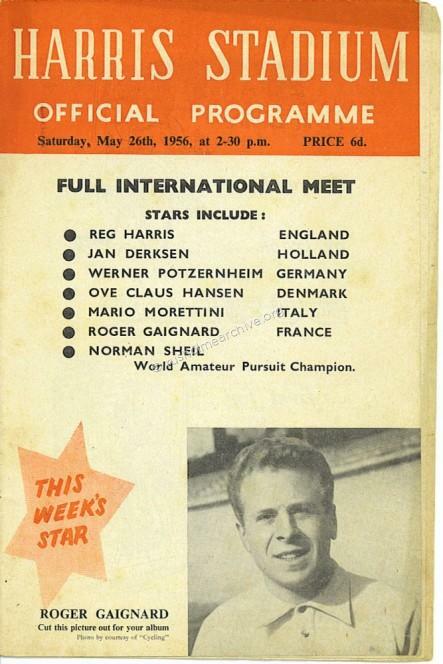 During Harris’ day many famous cyclists competed at the track including future Tour de France and world champion star Tommy Simpson. In 1910, when M. Bleriots flight across the Straits of Dover was fresh in everybody’s mind, the Club startled Manchester by advertising an aeroplane “ascent” as its Race Meet attraction. The expense was enormous, or so it seemed at the time, but the resulting “gate” justified it. There were twenty-thousand people inside the ground, and half as many outside, most of whom witnessed for the first time in their lives a heavier-than-air machine rise from the ground. It did not rise far. “It cleared the hoardings, with plenty to spare, and, continuing its flight over the heads of the people outside, came down quietly two fields distant,” but everyone was satisfied and the feature was hailed as a huge success. During the early 1960s Manchester University purchased the stadium as a playing field for their nearby Fallowfield Campus and it continued to be used for university sport though few probably ever knew that they were playing on a pitch that had once been used for an FA Cup final. But in 1994 the old stadium was sadly demolished and the site is now the Richmond Park Halls of Residence, its great sporting history lost forever. 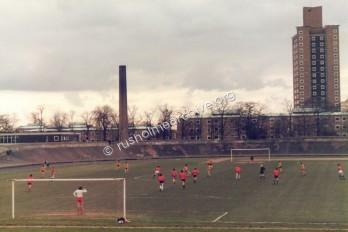 The image below is reproduced courtesy of Wikipedia and shows students from Manchester University playing in the Fallowfield Stadium in 1985.